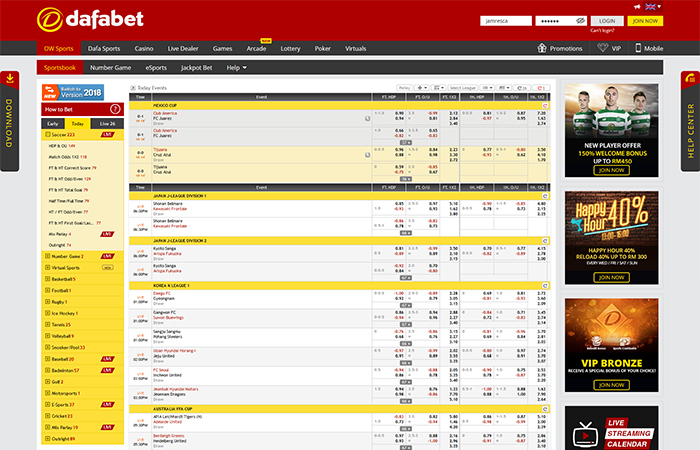 Dafabet Sportsbook is powered by ONEworks. As one of Asia’s premier betting sites, we provide customers with a variety of games, impressive odds, reliable customer service and some of the biggest bonuses available. Dafabet entered the eGaming Review’s Annual Power 50 at an impressive 21 in 2012 before climbing to 19 in 2013. Dafabet’s reputation as Asia’s most reliable betting site stands unquestioned and with plans to climb further up the rankings they are focused on becoming a top tier online gaming site. Sealing spot of becoming an official club sponsor of Sunderland AFC shows the commitment Dafabet has to growing the business and increasing customer experiences. Dafabet boasts competitive pricing whilst offering over 5,000 live events each week, together with very strong and attractive odds on live Asian Handicap betting. Dafabet ensures that players enjoy extra bonuses as reward for playing along with an impressive array of odds and bet types. Dafabet continue to develop ways for customers to have the best experience available. As an added incentive Dafabet also offers a unique VIP program for customers meaning customers are treated to some of the best rewards in the market.